If you want to explore the ocean this seed has 10 Ocean Monuments for you to do just that! 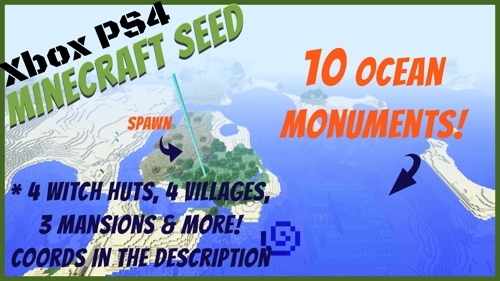 This 10 ocean monument Minecraft Xbox seed will be hours and hours of oceans of fun. Its a large map size and I've only looked around Spawn Map and adjacent maps. Otherwise there is still plenty to discover! 10 ocean monuments, 4 witch huts, 4 villages, 3 woodland mansions, 3 desert temples.. cords below! The seed was found Aug 4 2017.